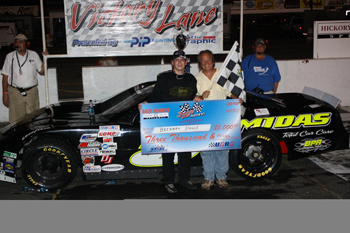 Brennan Poole becomes the first UARA driver to claim a second 2010 UARA victory in the action packed 2 nd Annual Banjo Matthew's Memorial 150. It was hard fought victory for Poole and he will deliver Kevin Blanks with his second Comp Cams Engine Builder of the Race award with the UARA for 2010. On a hot muggy Saturday the UARA-STARS diverge onto the grounds of Hickory Motor Speedway in preparation for the 2 nd Annual Banjo Matthews Memorial 150. The car count is a little low as is usual during mid season but the action will be hot, hot, hot. In round one of practice it will be Brennan Poole with the fastest time of 15.529 followed by Alex Yontz, Kyle Grissom, Ronnie Bassett Jr., and Coleman Pressley rounding out the top five. Round two of practice found the machine of Kyle Grissom setting the pace at a 15.613 followed by Brennan Poole, Clint King, Garrett Campbell and Alex Yontz as the top five quickest. When the time came for qualifying it would be Pressley who would capture the Sunoco Pole at a time of 15.365 with Grissom on the outside at 15.425. In pre-race activities during the regularly scheduled autograph session a table was set up at the winner's circle. Junior Johnson and Robert Pressley were seated at this table with their sons to do a special autograph signing in honor of Banjo Matthews. Johnson was a long time friend of Matthews and ran his chassis for many years. Robert Pressley drove Banjo Matthews built cars for the Jackson Brother's (Leo and Richard) early in his career. The 20 car field will go green at 8:40 p.m. and the action begins. Kyle Grissom shows his muscle and takes control of the field from the start followed by Pressley, Yontz, 2003 UARA Champion Lee Tissot and Poole as the top five. Position battles are happening throughout the field and no one wants to give. If a driver plans on moving on up, he is going to have to fight to get there. The racing will be fast and caution free for the first 49 laps. Position battles are all over the track. Pressley will take the lead from Grissom on lap 27 and start setting a blistering pace. Caution one will fly on lap 49 as the 01 car of 2008 UARA Champion Jake Crum spins in turn four. This is the first race with the UARA in 2010 for Crum. After a short caution the field will go green for another extended green period. Pressley will continue to set the pace with his fellow competitors in tow. Lap 72 sees the car of Kyle Grissom heading to the pits with obvious internal problems. Grissom will definitely be the ARBodies Hard Luck winner of the day. Not only did he suffer this racing problem, the team also had their toter home break down in the morning with transmission problems. They showed up at the track in the old school way with the car behind a pickup truck on an open trailer. They also had an enclosed trailer that they had swapped equipment into from the hauler. The open trailer sure brought back some good racing memories for the older set of racers from “back in the day”. It appears that Pressley is heading to a run away win until about lap 113 when his roommate Poole decides no way friend and starts to really put the pressure on Pressley. They do the side by side tango for several laps with the fans roaring. It is Pressley, Poole, Pressley, Poole with a nose in front not knowing from lap to lap who will come down to the line as the leader. Caution two flies on lap 127 when officials notice cars in mid pack start slipping and sliding and radioing that there is fluid on their windshields. As the field is under caution, trackside officials and the track cleanup crew check the track. Back to green the Pressley, Poole battle continues. On lap 135 Poole takes command and never looks back as the side by side, paint swapping, fender rubbing challenges are steady all through the pack. Tissot overtakes Pressley for second on lap 145. Coming down to the final lap it is any man's game for position. The field takes the white flag with Poole out front, followed by Tissot, Pressley, Yontz and Rookie contender Robert Johnson. It is coming to turn three and four where Yontz and Johnson really give it their all. Johnson gets a nose under Yontz in turn four. Nobody is going to give and Johnson lays the petal to the metal. There is contact but neither is going to give up. They slip and slide but remain under control and it would be Johnson who crosses the line just a fraction ahead of Yontz. There was a little post race tapping after the checker flies in turn three but all is done and forgotten by the time they get to the front stretch and line up as part of the top five finishers. In an interview earlier this year when asked who's driving style Robert's reminded him of Junior said “A little bit of David Pearson but sometimes he gets real aggressive---so I like that part of it. But when you start getting real aggressive, you're gonna have some accidents. That's where they come from.” It was this aggressiveness that came forth in Robert Johnson for the first time this season during a UARA event and it ended with the Rookie of the Race coming home with his best ever UARA finish, along with his second G Force Shift of the Race Award for gaining the most positions of seven. Once again the UARA-STARS have given the fans a race that they will be talking about for some time to come. for a holiday spectacular with great racing and a fireworks show to follow . 2002 Inaugural UARA Champion Danny O'Quinn, Jr. is an early entry for the Lonesome Pine race. We look forward to having the young man back in the seat at a UARA event. O'Quinn who is from Coeburn, VA will be right at home at "The Pine". The point battles are remaining very close for the UARA-STARS. Brennan Poole has closed the Coleman Pressley lead to 16 in the overall point battle. 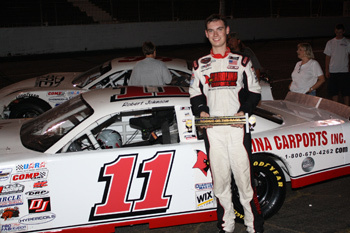 Robert Johnson inched ahead of Clint King for the Rookie title. 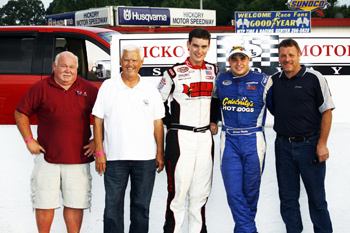 Johnson leads King by 17 points going into the Lonesome Pine Race with Ronnie Bassett, Jr. , Julia Dawson and Tyler English being the top five rookies. Below are early entries for the July 3rd Lonesome Pine race. More entries will be forth coming during the week.